We received several comments about improving our Craigslist ad with interior pics and Twayler's floor plan. I am very fortunate to have you looking over my shoulder and helping me! We do not have any time constraints for disposing of Twayler's stuff. And, selling Twayler as well. As long as it takes. We plan to advertise Twayler on other websites besides Craigslist. RVTrader.com looks good! Here is a [Link] to an ad on RVTrader.com. For the exact trailer as our MsTwayler. New! For less money than the price listed on my Craigslist ad! Yesterday, I exhausted myself cleaning Twayler's living room and kitchen. This included packing up all the stuff that was there. Took about three hours to complete. And, near the end of those three hours, I plunked myself down in the La-Z-Boy recliner to rest. Did that plunking a bunch of times too! an hour after finishing all of that, I had recovered. Not tired anymore! I spent about four hours preparing my Selling Stuff Blog page [Link]. Only two replies to show for the effort. I am going to take Reader Mister Ed's advice and pawn it! I've just uploaded a bunch of pics to our Craigslist ad. Changed the text to emphasize the La-Z-Boy recliner replacing the dinette. Also, the full extension slide-out drawers in the pass-thru storage cabinet. Please click [Here] to view the ad. We wish to convert Scampy's propane system from 1-tank to 2-tanks. 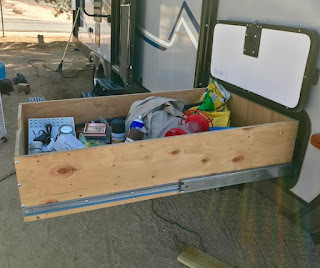 A couple of weeks ago, we bought all the stuff needed for this conversion. Now, we need Scampy's tongue adapted for the conversion. A welding shop would be perfect for the job. We found High Desert Welding on the net, and phoned over there. Owner Vince asked me to drop by to see what I wanted. Now we have an appointment for this coming Monday at 7am. We want the two propane tanks to be at the rear of Scampy's tongue. The battery will be at the front. BTW, did we mention that we bought a new House Battery? It's [This] one. MsTwayler has a bunch of papers and photos of mine. What to do with all of this stuff? They could be all digitized. That would save them needing space in the limited area that Tránsito and Scampy have available. Eventually, we very likely do that digitizing. However, just this afternoon we spotted a nice storage area at the rear of Scampy's big storage compartment. The one next to our shower. So, for now, all those papers are going there. Sounds like you are getting things under control , just make sure to pace yourself and all will be good. You are up early too. It's a bit after 4am here in Apple Valley. And I am going back to sleep a bit. Hi George, I am always up early usually around 4 am. Before you pawn anything try your local Facebook yardsales. We have had fantastic luck selling unwanted items. Things sell really quick. This company was highly recommended for selling a RV. Their web is recreational vehicle select. phone 813-655-2877. Look them up. I phoned them. They are located in Florida. Not competitive for travel trailers because of distance. Can you have a "garage sale" at your current location? The RV Park does not permit items for sale to be displayed. As they are in a garage sale. Yes! Good idea. Pics of all four sides. I am intending to put more pics on my ad. Kinda ran out of time for Craigslist today. Tomorrow looks better. You always have good ideas, Ed! And I really appreciate them too. Following your idea about persons in the fire area, I just published a duplicate ad in Craigslist Mendocino. Hi George—you might want to look in to the OfferUp app. It provides high exposure to local contacts who are looking to buy and sell. I have had more success with it than I ever did with Craigslist. I am only a few years younger than you are, but I get tired just reading about all you do! Take care and remember to be good to yourself! After I read your comment, I went over to OfferUp and placed an ad to sell Twayler! George- First of all your Craigslist ad looks fantastic. I just sold my trailer on Craigslist. I'm downsizing to a truck camper but I'm not a full timer. I was in no hurry to sell but the Craigslist flakes wore me down. You are probably more patient than I. I sold a trailer on RV Trader about 10 years ago and that went really well. Serious buyers mostly. The suggestion posting in Nor Cal was good. You might add Sonoma and Napa counties as well. Good luck. It's a really sweet Twayler. And thank you also, for your suggestions about Craigslist in Sonoma and Napa counties! Also, RV Trader.